The Factions of Tamriel are diverse and varied. Generally, a "faction" is any named association of people not covered in one of the other categories. This includes everything from religious orders to education institutions, guilds to armies, vampire clans to pirate groups, and even dens of thieves to governmental departments. Lore:Factions functions as a catch-all category that is better understood by what it does not include rather than by what it does. Races or personae, like the Gray Fox or the Shezarrines, are not factions. Groups of beasts or deities also do not belong here. 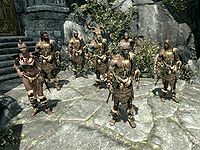 "Association" is construed liberally; people who have never met and don't consider themselves united may nevertheless be considered a faction, like the Ashlanders. 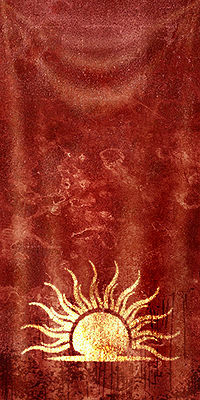 Historically prominent families and clans, like the Direnni clan, may also be included here. A name is the only real constant that every faction must have. Any given generic group of pirates, bandits, or thieves is not worth mentioning. But once they give themselves a distinct identity by declaring a name, like the Blood Horkers, Summerset Shadows, or Wharf Rats, they become an identifiable faction that should be included in this category. The line between a group of people and a group of beasts or gods is not always clear, but we follow the general delineations made by most of the games. Thus, a named group of goblins or Falmer could not be a faction, because they would not be composed of "people". However, a named group of Orcs or civilized Snow Elves would be considered a faction. This page was last modified on 29 November 2017, at 09:24.